individual development proposals on resource lands are of great concern to a Valley that has a limited supply of agricultural lands and other lands vital to keeping our communities livable and sustainable. These individual land use applications, if not monitored for compliance with all applicable state and local land use laws, together have the potential for converting significant amounts of resource lands to rural sprawl. This would result in widespread damage to the qualify of life in the region. 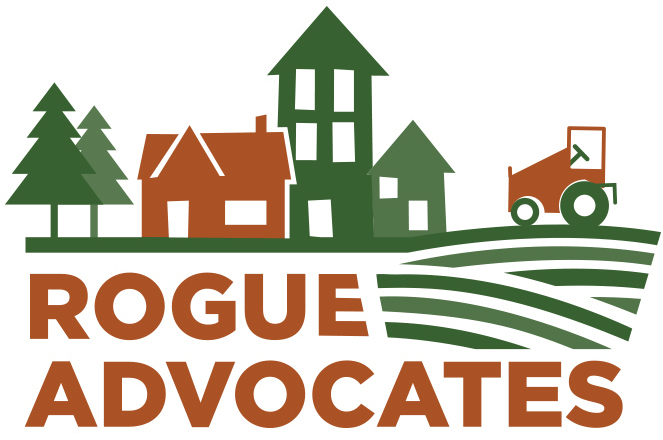 Rogue Advocates has been working with the Hugo Neighborhood Association to ensure that land north of Grants Pass that is bisected by the Applegate Trail and other important historical landmarks is protected. In 2005 an 88-acre subdivision called "Pioneer Meadows" was proposed and Josephine County approved it in 2007 pursuant to a Measure 37 claim. Before Measure 37 was enacted, this type of land use was prohibited, as the land is zoned "Woodlot Resource," having significant forest resources. Measure 37 allowed uses ill-suited to resource lands like residential development to be approved. With Rogue Advocates' help, the neighborhood association appealed the decision in 2008 on the grounds that cultural, historical and environmental concerns had not been adequately addressed. In January 2009, LUBA reversed the approval of the 16 parcel subdivision. Unfortunately LUBA never had the chance to address these many concerns. Instead, LUBA reversed the decision on the grounds that the decision was based on an illegal Measure 37 claim. Measure 49 had repealed Measure 37 and allowed only projects which had already made a significant amount of progress to go forward. Here, Pioneer Meadows had not. For more details, see the Daily Courier's article: LUBA Puts Brakes on 88-Acre Pioneer Meadows Subdivision. Rogue Advocates has also been working with local neighorhood groups to keep a 157-acre expanse of land north of Grants Pass as farm and forest land. This parcel, referred to as the "Ockenden parcel," is one of the last large tracts of rural land remaining in the area and it is critical to preserve these large areas for farm and forest production. A few years ago Josephine County approved a request to amend the county's comprehensive plan to change this land from farm use and woodlot zoning to rural residential zoning. The zoning change would open the land up for subdivision into 5-acre minimum parcels. In addition to the need for keeping rural lands intact, there are also serious concerns about whether this parcel of land and the current transportation route available can adequately accomodate this proposed development. To address these concerns, Rogue Advocates and neighborhood groups worked together to appeal the county's decision to change the zoning. LUBA has remanded the county's decision, which means that sometime in the near future a new county hearing about this plan amendment wil take place. More to come on this . . . Update: This remand hearing is now scheduled for Dec. 8, 2010 before the Josephine County Board of County Commissioners.